I want to replace the enduro tires with a 2.3+ and keep the weight down. What tire have you had success with stans. Also, when are you heading to Moab? I'd like to meet up with you guys again this year at least for an extended weekend. Geez man, I thought you'd ride with us for at least a week. Well, we'll be there from 4-28 to about 5-10, 5-11. One of our locals that you haven't met(?) will be there on his new Dirt Bag and should provide some entertainment...Baron Miller. I'm doing a little more on my Nomad... I think you'll be surprised. On the tires, you may know we've been running 2.5 Weirwolf Race models with pretty good results. However, since I've gotten the Nomad I've gone through a couple of rear Weirwolfs in very short order out at Bronte. I've been riding gnarlier and faster with some jumps and drops thrown in. The front 2.5 Weirwolf Race has not had one problem. The rear one, however, run as a tubeless has had two sidewall cuts in the big rocks out at Bronte. I researched many tires and decided on the 2.3 Weirwolf FR model with a heavier sidewall and carcass design. The 2.3 Weirwolf is fine for a rear tire and is big enough for hard riding. I still like the 2.5 Race model for the front. The 2.5 Race weighs 745g and the 2.3 FR weighs 830g. The 2.3 FR sidewall is very noticeably beefed up. That's what I'll run at Moab. I had really good results with those red 2.5 Michelin Hot S models too, but that damn color is hideous. Why can't they make that tire in black? That tire is the carbon copy of a DH-24 2.5 model except in a lighter but still beefy carcass. I've been riding gnarlier and faster with some jumps and drops thrown in. LOL!...I'll have you know I can jump off of any 18 inch drop as good as the next guy! You know an extended weekend is like 5 days right. I'm looking into those tire right now. I tried the stock enduro tires with tubes but flatted 3 out of 4 rides. I tried tubeless but I have an inch long slit right next to the bead that will let air escape on every hard hit until it's flat. 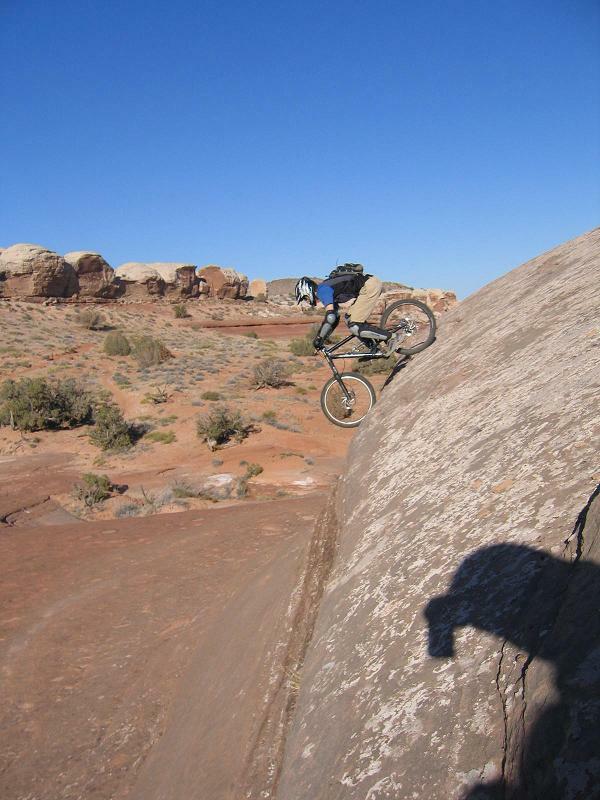 I dont rememer you riding that slow last time we were in moab. I came around a corner on porqupine and you took a spill without a scatch. Baron used to ride a bullit right. If so, I've known him a while and am sure he'll tear it up. What trail you looking forward to most. I think for me it's bartlet. Porc's always my favorite, but I really like most of them. I wasn't sure if you knew Baron or not. Allegedly Shiver is meeting up with us too. Maybe he'll be riding his April Fools M3...LOL!